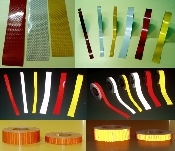 Welcome to REFLECTIVE TAPE STORE - Division of Reflective Inc.
We carry quality Nikkalite and Reflexite reflective tape as well as DOT and SOLAS tapes. We have flexible engineer grade in 1", 2", 3", 4", 6", 8", and 12 inch widths and can custom cut rolls. We carry red, white, yellow, orange, gold, blue, green and black in the flexible engineer grade. In our high intensity line we carry the same colors minus gold and black. We also have a stretchable high intensity tape in white, yellow and orange. Our DOT tapes are red and white (silver) and are available in 1 and 2 inch rolls. We have striped barricade tape available in red/white and orange/white. We have traffic cone reflective collars in the high intensity wrap around style. Finally, our SOLAS tapes are available in 1, 2 and 4 inch rolls. Our Type 1 Engineer grade tapes exceed ASTM D4956 Type 1 requirements and our type 3 High Intensity tapes exceed ASTM D4956 Type 3 requirements. Our DOT tapes are C2 rated and exceed all requirements for conspicuity tapes in both the US and Canada. Our SOLAS marine tapes exceed Coast Guard requirements for marine applications. If you would like a small sample of any product please contact me at the number above or email me with your name, address and the type and color sample you would like. To see our full line of ultra bright micro-prismatic reflective tapes go to www.reflects-light.com. 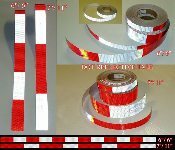 We also carry custom Reflective Shapes, Prismatic Grade Tapes, Reflective Road Markers and Pavement Marking Tapes. 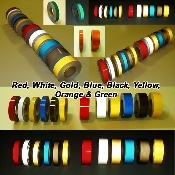 1 inch x 150 foot reflective tape roll. Available in White, Black, Red, Blue, Yellow, Orange, Green and Gold. 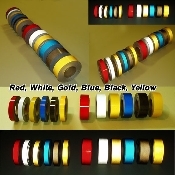 2 inch x 150 foot reflective tape roll. Available in White, Black, Red, Blue, Yellow, Green, Orange and Gold. Engineer Grade Pre-Striped Reflective Barricade Tape. ASTM D4956 Type-I Reflective Vinyl Rolls. Used in a wide variety of applications from barricades to vehicle conspicuity striping. Approximately 75 Candlepower. High Intensity Grade Pre-Striped Reflective Barricade Tape. ASTM D4956 Type-III Reflective Vinyl Rolls. Used in a wide variety of applications from barricades to vehicle conspicuity striping. Approximately 250 Candlepower. 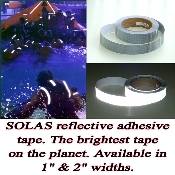 Reflexite SOLAS Coast Guard Approved Tape is the toughest and brightest tape on the market. We have it in 1" x 30', 2" x 30' and 4" x 30' rolls. It is used for everything from Life Vests and Life Boats to Motorcycles and Backpacks. Reflexite SOLAS 1" and 2" x 150' rolls. Coast Guard Approved Marine Tape is the toughest and brightest tape on the market. It is used for everything from Life Vests and Life Boats to Motorcycles and Backpacks. 4 inch and 6 inch high intensity reflective traffic cone collars. Cut from reboundable type III high intensity reflective sheeting. Wrap around type. DOT approved. Sizes to fit 18, 28 and 36 inch tall cones.